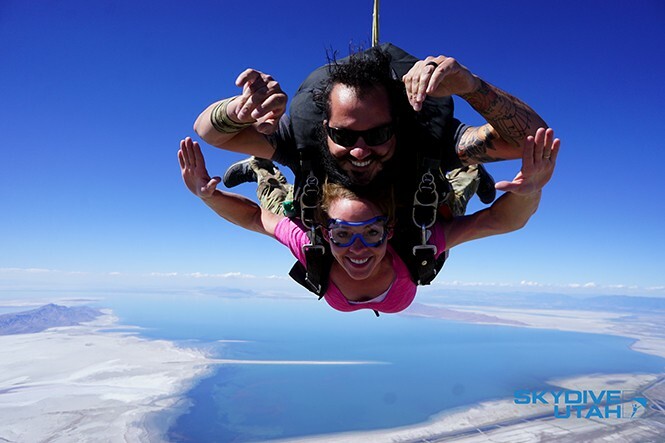 Mike Chapman and a Skydive Utah client in midair. Astronaut Chris Hadfield once said, "No astronaut launches into space with their fingers crossed." Hadfield's beliefs are shared by Skydive Utah owners Mike "Chappy" Chapman and Marc Warren, so it's no surprise that Chapman feels apprehensive when he hears the term "adrenaline junkie." "To me, it's kind of a negative connotation," Chapman explains. "It's the word junkie—it doesn't imply safety. ... Safety is No. 1 here, and that's what keeps this place with a good reputation. I've got over 4,000 jumps but I still get a little ..."—Chapman doesn't dare say the word "nervous"—"but that's what keeps me safe; that's what keeps me on my toes." The bearded, charismatic co-owner is busy on a hot afternoon with first-time jumpers, as well as veterans of the sport. Chapman offers a guided tour through Skydive Utah's parachute room. "This is where we do all of the emergency chutes with FAA riggers, including myself," Chapman says as he makes his way through the room. FAA riggers are licensed parachute packers who specialize in repair. They have logged a minimum of 20 hours packing reserve parachutes with a master rigger. "We've got about nine sewing machines to keep everything in top condition," Chapman says. Most of the instructors at this Tooele airstrip have double the amount of experience it takes to jump. Chapman calls the area a technical drop zone due to its high altitude, which causes jumpers to fall more quickly than drop zones at lower altitude. "Everything is a little faster here," Chapman says. "I mean, we are at 4,500 feet." As we kick back enjoying the air-conditioned trailer, Chapman's business partner, Warren, and a friend open the door and announce that a fresh group of tandem jumpers has arrived. First-timers Edward and his son Adam share the same feelings everyone gets on his or her first jump. The father and son are jumping as part of a promised graduation present. "I was kinda hoping he would drop out of school," Edward jokingly says, his voice ringing with excitement. "No, I'm very proud of him, and that I get to do this with my son." There's a special calling that brings people in droves to spend an afternoon jumping out of an airplane. Born into a military family, Chapman enlisted in the Air Force. During his six years of service, he started skydiving on weekends. "I got into it just for fun with my buddies," Chapman says. "Once I decided to get out of the Air Force, I said, 'You know what, I'm going to try and be a full-time skydiver.'" Chapman later became a licensed pilot and started managing Skydive Utah with Warren in 2012 under Skydive Utah's founder, Jack Guthrie. In 2016, Chapman and Warren bought the operation from Guthrie, who was looking to retire. Before clients jump, they must watch a safety video. In it Guthrie's hard to miss. He's the guy who looks like long-bearded ZZ Top bassist Dusty Hill. Guthrie doesn't consider himself a skydiving "pioneer," but has spent decades pursuing the sport. When he started, there were no websites or forums to reference drop zones and other instructors. He had a dream of skydiving; all he had was an airstrip, a leased airplane and a couple of parachutes. Today, his dream has progressed technologically into a worldwide community of skydivers. "Jack taught us everything he knows," Chapman says. "He liked the direction we were taking the drop zone. We revamped the website, got on Facebook, started digitally advertising. Now we're doing more jumps than ever." Skydive Utah is full of colorful characters, including Lindsay Rich, one of only 26 female tandem instructors in the U.S. Chapman points out that Rich has been instructing longer than he has been jumping. She also runs Skydive Utah's student program. Despite the sport's growth, female instructors are relatively rare. "I started about 10 years ago," Rich says, when women instructors were few and far between. "But there's more and more each day." Rich holds a small wind-monitoring gadget in the air, which is a crucial step before taking first-time tandem jumpers like Edward and his son. If the wind speed is over 14 mph, they won't be able to jump today. Unfortunately for the nervous Edward, the weather is just right. "Oh my gosh!" Edward shouts, red-faced after their jump. "It was a very spiritual thing." Whether it's scheduling jumps, packing parachutes or measuring wind speed, "it takes a team" Chapman says. "It's a community here. Seeing everyone come out here jumping for their first time helps me wake up every day and do it again."